Award-winning rock/blues band Red Butler will be plugging their new album when they play in Derbyshire this weekend. The young Brighton outfit are eagerly looking forward to next month’s release of their second long-player, entitled Nothing to Lose. 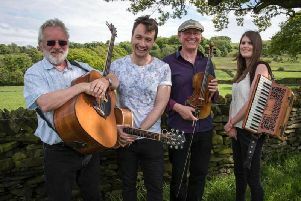 Music fans will get a sneak preview of the new songs when Red Butler play at Clowne Community Centre on Sunday, October 20. The upcoming album follows the band’s debut release, Freedom Bound, which came out two years ago. l Alex Butler (lead guitarist) – runner up in young artist category – British Blues Awards 2016.
l Band – third place in best blues band category – British Blues Awards 2016.
l Representing the UK at the European Blues Challenge in Italy 2016.
l Winners of the UK Blues Challenge 2015.
l Runners-up in the British Blues Awards 2015 (Alex, Young Artist and Band, Emerging Artist). Alex established Red Butler in 2012 with the line-up of Jane Pearce on lead vocals, Charlie Simpson on drums and Mike Topp on bass. The band toured with Laurence Jones Band, Billy Walton Band and Danny Bryant, learning a great deal in the process. With the heavier sound of Nothing to Lose, guitarist Dan Spellman has been added to the line-up. Dan previously worked with Alex and Charlie in the band ColdHeat. Despite an average age of 24 the band members bring a wealth of experience enabling them to transmit their energy to ignite audiences. Red Butler see the need to deliver a message to younger peoplewhilst retaining the support of their established blues/rock audience. Influences include SRV, Free, Red Hot Chili Peppers, Foo Fighters, Gary Clarke Jr and artistes such as Royal Blood and Vintage Trouble. In 2017, the band are looking to break further into Europe and spread their music to younger fans in this country.